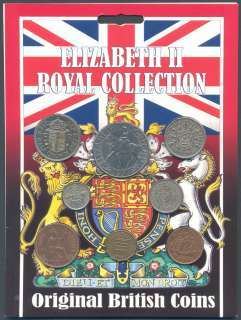 This Elizabeth II Royal Collection coin pack contains 8 coins, all held in a clear blister on a card. Elizabeth II was born on 21 April 1926. She acceded to the throne in February 1952 after the death of King George VI and was crowned Queen of England at Westminster Abbey in June 1953. When Elizabeth II began having coinage made with her image on in 1953 the pound was divided into 240 “old pence”. There were 20 shillings to the pound and 12 old pence to one shilling. There were two halfpennies to a penny and the sixpence had a value of six pennies. 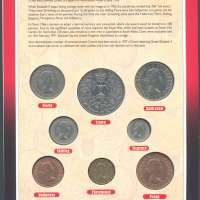 During this time the main circulating coins were the Halfcrown, Florin, Shilling, Sixpence, Threepence, Penny and Halfpenny. In March 1966 a decision to adopt a decimal currency was announced, where one pound would be divided into 100 pennies. Due to the significant quantities of coins required the Royal Mint, which had been located on Tower Hill, London for more than 150 years was moved to a new mint in Llantrisant in South Wales. Coins were stockpiled and on 15th February 1971, Decimal Day, the United Kingdom decimalised its coinage. Since decimalisation a number of commemorative Crowns have been struck. In 1977 a Crown depicting Queen Elizabeth II on horseback was struck to celebrate her silver jubilee, and is the only decimal coin in this pack. 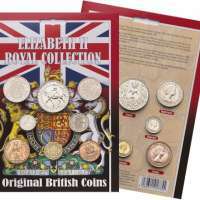 This Elizabeth II Royal Collection coin pack contains 8 coins, a florin, crown, halfcrown, shilling, sixpence, halfpenny, threepence and penny, all held in a clear blister on a card. The card has the image of a Union Jack and the Royal coat of arms on the front and historical information on the reverse. 2012-08-07 : Thanks to Nick G. for pointing the Latin terminology.